Ancestors were "Torinesi, repubblicani e cowboys"
Perino’s great grandparents, Matteo and Rosa, were Italian immigrants from Torino who migrated to Montana in the 1800s. Perino’s grandfather was a Marine who served in World War II. Her great grandparents were “Torinesi, repubblicani e cowboys,” according to a recent interview in Corriere della Sera. “My ancestors were the real pioneers of the Far West,” Perino told the paper. Perino was born in Wyoming, and grew up in Denver, Colorado. In 1994 she graduated from the University of Southern Colorado with a BA in communications, and later obtained a Masters in publc affairs from the University of Illinois. After a four-year stint as press secretary for Congressman Dan Schaefer from Colorado, she moved to England, married, and in November 2001 returned to Washington to serve as a spokesperson for the Department of Justice. Perino was appointed Deputy Press Secretary in late March 2006, taking on the role of Bush’s main press liaison and communications adviser. She also served as Acting Press Secretary and ran press briefings while then-Press Secretary Tony Snow underwent treatment for colon cancer. 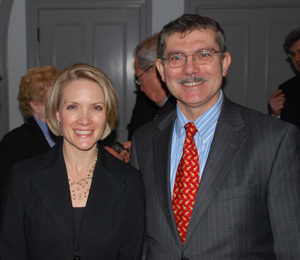 Pictured at right, Dana Perino and Francesco Isgro. Photo by Cristiano Del Riccio.